Kortier Electric Lever Harps are extremely portable, very lightweight, yet have a full range, and a huge sound. I make them in three sizes- the 31 string which is the most popular, a 24 string lap harp size, a 36 string floor standing harp. The bottom notes of all these harps are lush and full, the upper range is very clear and harplike. The output will give excellent results with any sound reinforcement system, including effects pedals and wireless systems. Carefully laminated 5 ply neck and pillar of select hardwoods, very strong yet resonant. Kortier piezo pickups on every string, developed specifically for harps. Loveland sharping lever on every string. Fluorocarbon strings, metal in bass octave. The built-in Fishman Powerjack preamp is powered by a 9 volt battery, good for an estimated 1,000 hours of use. No other maintenance or adjustment of the system is required. Just plug in and play! Stand (base board) clamps onto slots in side of body, no tools required. 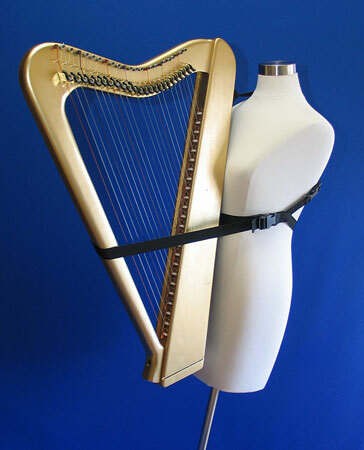 Small electric harps can be played on a shoulder strap or a harness. This allows the harpist to move about easily while performing. The Kortier Electric 25 is the ultimate travel harp- 33 inches tall, range to one octave below middle C, 8 pounds in weight, HUGE sound. It can be played on a harness as shown here, or clamped to its baseboard like the larger electric harps. Or, play it in your lap with no stand or harness! Same pickups, strings, levers, and most importantly, the same big sound as the larger harps, but in a very small package. Kortier Electric 31- my most popular electric harp-very portable! Bottom note C, two octaves below middle C.
31 strings, top note is E.
Proper tension and string spacing for good technique. Well balanced, comfortable to play, very portable. Fitted travel case suitable for shipping or baggage check. Case is 42 x 32 x 7 inches. Click here for photo. 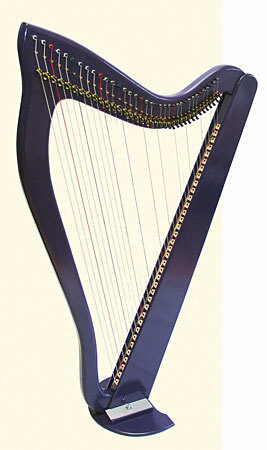 Total weight of harp in its case is less than 25 lbs. Harp alone is about 14 lbs. 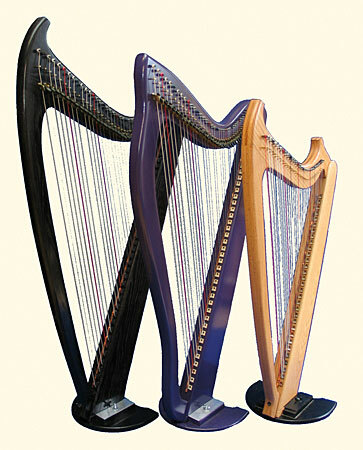 The 31 string harp is available in a variety of colors, painted with a durable enamel. E36A- 36 string floor standing harp with range to bottom note A, easily packs flat in its case, quick set up. 50 inches tall, about 15 pounds in weight. The neck and pillar unit are the same outline as my Professional model Acoustic/electric 36 string lever harp.